LAST UPDATE: Friday 9 December, 2016. Harley Bennell will head to Germany this week for treatment on his troublesome calf… he was also caught this week driving without a licence (after it was suspended for losing his demerit points). Shane Yarran is on indefinite personal leave from the club after being charged with unlawful wounding over an incident in 2015. Aaron Sandilands says he is 100 per cent. 211 is $450K – a 15% discount on his 2015 average (under the new common sense rule as Calvin calls it). That prices him in the mid-70s. Corey Wagner (who I would like to forget about after picking him mid-season) progressed the furthest for North Melbourne in the multi-stage fitness test. Mitch Hibberd (DEF/MID, $150,000) is the name that matters here after finishing second. He was the eighth highest averaging player in the U18 Championships last year but judging by the tweet below from the Freako, he was brillinat in his last VFL game of the year scoring 119 thanks to 34 disposals. The pre-season watchlist definitely has him towards the top when it comes to cheap defenders! We haven’t see a lot of Jamie Elliott (FWD, $330,000), Matt Scharenberg (DEF, $234,000) and Jackson Ramsay (DEF, $383,000) but the trio are into full training and are definitely worth thinking about for 2017 at their respective prices. Elliott is priced more than 25 points cheaper than his best return after missing all of last season with a back injury andScharenberg is a bargain with his 30% discount. John Longmire said that Isaac Heeney (FWD, $442,000) and Callum Mills (DEF, price yet to be determined), are in line to fill the void left by the departure of Tom Mitchell. “We knew we’ve got Heeney coming through and Mills coming through and kids like Jordan Foote all pushing for midfield spots and playing through that area of the ground,” Longmire said. “We’re really confident that we’ve got the players to be able to come in to that role and keep evolving our list like we did last year. “Mills was part need, part teaching last year playing at half-back and just took to it unbelievably well. Heeney has been at the top of my Fantasy Classic forward list since the end of the season… and this means I will probably change that pencil to a permanent marker. Gary Ablett is out with Tom Lynch and Sam May the new skippers. Fantasy relevant? Probably not. The ninth most expensive forward available next year, Isaac Smith (MID/FWD, $538,000), beat last year’s winner Billy Hartung in the Hawks’ 2.2km time trial. The new pre-season games, formerly known as the NAB Challenge, will start on Thursday 16 February with four weekends of action for us to help with our Fantasy study. In a great news story this afternoon, Jarryd Roughead has announced that he has been given the all-clear to resume full training. Sensational news for footy but also for Fantasy as he has a 30% discount for not playing in 2016, making him a very tasty $373,000. Roughead averaged 88.2 in 2015. Luke Parker will not return to training until the new year following arthroscopic surgery to assist his recorvery from the PCL injury he suffered int he preliminary final against Geelong. He should be crossed off your list as you don’t start a premium midfielder at his price ($663K) if he doesn’t start training until after Christmas. Tom Papley developed compartment syndrome and because of surgery, he will be off his feet for around eight weeks. Eagle Jack Redden had an ordinary 2016 where he averaged just 64.8 and spent some time in the WAFL. This is a far cry from his last five seasons where he has returned 109.1, 102.6, 94.8, 105.6 and 97. Coach Adam Simpson has said that he, along with Lewis Jetta, has returned to the club this pre-season in good nick and has posted personal bests in time trials. A potentially cheap Nat Fyfe is back with the club and in full training after just playing five games in 2016. 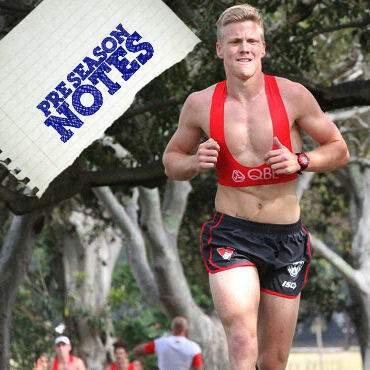 Finishing first in the Swans’ time trial, Dan Hannebery showed no signs that his knee injury from the Grand Final would slow him down this pre-season. He couldn’t run for a month following the big dance but he required no surgery so Fantasy coaches keen to start with him or draft him early, don’t need to worry. Appears that Fyfe and Beams have not been given any discount for their lack of games last year. Have been priced based solely on their 2016 average. Beams Average 86 in 2016, Doubt he will be that cheap! More priced around the mid to high 90’s in 2017. Fyfe averaged 98.6 in 2016 which is exactly what he has been priced at. bty – I am talking RDT prices atm. Be ok so in SC if I paid me $20 last year it’s open now? Anyone have any idea when you’ll be able to make your AF side? Looks weird in team picker to see SMitchell in WC colours, also JLewis in Melb colours. Anyone know when they’ll open the drawing board? Re Mitch Hibberd: was Freako speaking about his season average or just his last game??? Warnie interpreted is as the former, but I thought it was the latter. Yeah – actually, reading that again it looks like the latter. I will amend. Any idea as to when DTLive will open up their 2017 team planner? ?